LENGTH: 88 INCHES, WIDTH: 22 INCHES, HEIGHT: 53 INCHES. SOLD ! 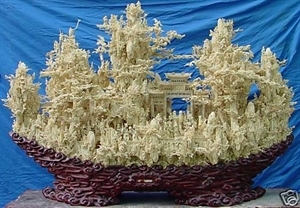 This is HUGE bone carving. The entier work special made into antique color. Many fairies are carved on the mountain. It is a grand celebration. It took our sculptors 4 months to complete. All hand carved from genuine high quality bones.